Barkzilla: A Savvy NYC Dog Blog: Royal Canin X-SMALL Dog Food & Spa Day Giveaway! ALSO, don't forget to enter the Royal Canin Treatment sweepstakes. One lucky pet owner will win free food and grooming for life along with a shopping spree for their extra small companions. The sweepstakes runs through June 1, 2012 and also offers pet parents the chance to win more than 500 instant win prizes ranging from gift cards and toys, to travel and grooming gear. You can enter daily, so don't forget to bookmark this one! Is your dog a Royal Canin fan? Domino is also a Royal Canin fan. Though he's only half yorkie, we've been feeding him the Yorkie puppy formula (which he loves). Thanks to your review, I think we'll test drive a bag of X-Small puppy. Thanks for the tip! She deserves it because there is nothing in the world she would not do for me or someone else! My pup is my best friend!! Addie is a royal canin fan! Their hypoallergenic food was the only thing that she could eat for a long time! Luna totally deserves a day of pampering! As a dog recently adopted from the SPCA with no known history, who knows the troubles she may have been through in her life. She deserves all the care in the world so that she feels she's finally loved in her forever home. We adopted Dumpling in the beginning of the year from a nearby shelter. He is a shih tzu mix and is 1 year and 7 months young. He was in the shelter for more than 2 months and we do not know anything about his past life, so we think he deserves some pampering! My little Moe deserves to win because he is a growing puppy who loves his spa time with mommy. 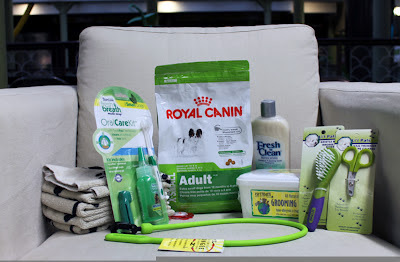 Thanks for the great Royal Canin review. It will be the next brand that we try! My dear Bebe deserves a doggie day of pampering after having a near death experience last week, Suffered an anaphylaxis shot with a rabies vaccine. My poor baby was places in an oxygen tank, took a steroid shot, and had a dripping IV inserted in her arm. She's OK now but was very weak and ill for 3 full days. Also the dogs would love to try the new Royal Canin X-small dog food!! Thanks for the chance! Snoopy greets us enthusiastically every day when we get home from work. We would love to reward her enthusiasm with a day of pampering, just for her! Ming deserves a day of pampering because she is a shelter dog...had some hard beginnings! She works hard everyday to please us! 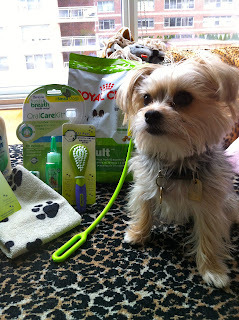 Aw these items would be perfect for my doggy. I sually bring my pup for a dog grooming in long island and I know when I groom him at home, I can be as good as they are.